LEED-certified buildings are not just built with energy efficiency in terms of electricity and lighting; many different aspects of a building’s operation and maintenance are taken into consideration. In fact, HVAC plays a role in LEED construction: specifically, a building’s heating and cooling equipment is designed and installed to be as efficient as possible. In this article, you’ll learn how a technician can help a building owner become certified, as well as the HVAC training requirements for a career in this green industry. The acronym LEED means Leadership in Energy & Environmental Design. It signifies a certification given to buildings that utilize renewable energy and represent green leadership. 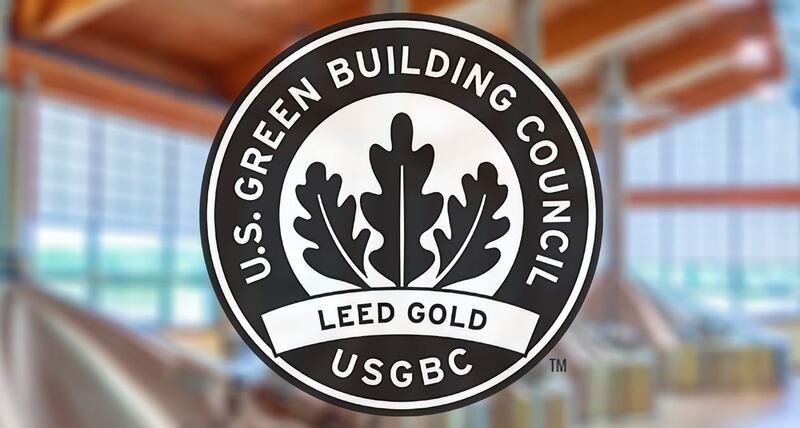 Ultimately, this certificate, established through the U.S. Green Building Council, is meant to change the way people think about construction and design in terms of its impact on the environment. These structures also reduce how much money is spent on energy. Additionally, they save natural resources, some of which are diminishing due to the growing global population. They’re also meant to have a positive impact on the health of those who live or work in the building. There are five main certification categories: homes; building and design construction; interior design and construction; building operations and maintenance; and neighborhood development. A construction project can reach one of four levels of LEED certification: certified, silver, gold, or platinum. The number of points a project receives determines its level. For instance, a building must earn between 40 and 49 points to be certified. Silver projects need 50 to 59 points, gold projects need 60 to 79, and platinum require 80 or more. An HVAC system for a LEED-certified building should have the Environmental Protection Agency’s ENERGY STAR label, an international standard for energy-efficient products. The higher the rating is, the more efficient the system. An HVAC professional can help determine which unit is the most eco-friendly in relation to the size of the building. The unit will save the building owner money on energy bills and will help the environment by wasting fewer resources. Another valuable part of the HVAC system is air filtration: a factor of certification, proper ventilation benefits occupants’ health, in particular, those with asthma or allergies. HVAC equipment will influence the score the building receives. In fact, two different scoring categories that make up 40 percent of the points pertain to HVAC: Energy and Atmosphere (EA) and Indoor Environmental Quality (IEQ). The Energy and Atmosphere category is worth up to 38 points while Indoor Environmental Quality is worth 21 points. In other words, if your building receives 50 points on the grading scale, 20 percent of those points are from HVAC. Why Should HVAC Techs Know About LEED? HVAC professionals should know about LEED certification because it is increasingly becoming mandatory for new construction. Several federal agencies and state and local governments now require that official projects comply with the LEED green building certification program. In addition, building codes throughout the country now include elements of the LEED rating systems. LEED certification is also popular. More and more people want to help save the environment and conserve natural resources—and most also want to save money on their utility bills. With asthma and allergies so common, having a heating, cooling and ventilation system designed to reduce allergens and other airborne irritants is important for many Americans. HVAC has a larger impact on LEED certification than water and electric combined. As people seek to maximize their buildings’ scores, technicians with LEED training in addition to a formal vocational training may find greater job opportunities and have the satisfaction of knowing their work contributes to building practices that benefit the environment. Ultimately, a technician who is knowledgeable of LEED certification will be more versatile. In order to work in the LEED-certified building industry, an HVAC professional must have special certifications and advanced training; therefore, it may be necessary for an individual to complete his or her HVAC education at an accredited vocational school first, such as The Refrigeration School. Employers often prefer to hire those with formal HVAC training, so starting at a trade school may secure greater job opportunities and the experience in the field that can prepare one for higher-level certifications and training. To learn more, contact The Refrigeration School today.